Review The CX3 makes an underwhelming first impression. 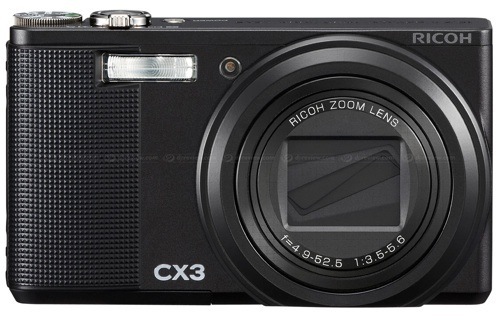 Where high-end compacts such as the Canon G11 and Panasonic Lumix LX3 go all-out with manual controls scattered across the body, the Ricoh is decidedly bare-looking. Certain settings, such as white balance, exposure compensation and ISO can be accessed by prodding the joystick control in the upper right corner, but otherwise you'll need to resort to the menu system on the back. The 3in screen is as high resolution as they come, but the text-only menu system can be challenging for beginners, or even for more advanced users who are accustomed to standard camera iconography. But I'm more than happy to let this go, as the Ricoh atones with some excellent performance. For one thing, the lens is the joint longest here alongside the Nikon S8000's - 300mm is enough to return some excellent shots of distant or small subjects. Image quality is better than the S8000's as well: there's less purple fringing, and the lens only begins to show softness in the farthest corners. Our only concern was its ISO performance, where it's merely middle-of-the-pack. 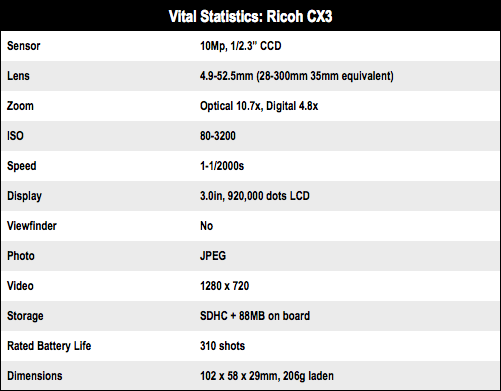 Ricoh rolls out electrifyingly exciting RUBBER!